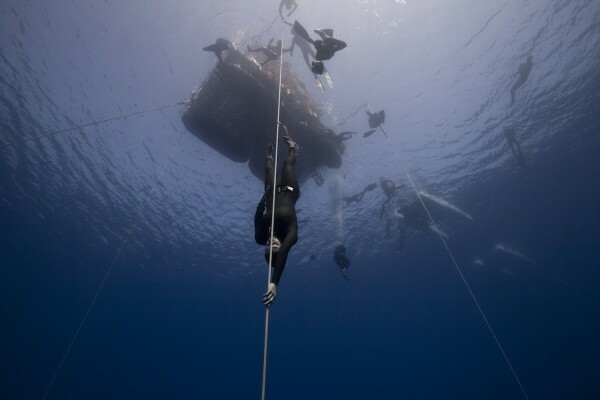 Today on just day two of the “mini-comp” before the 2013 AIDA Individual Depth World Championships, in Kalamata, Greece, Jeanine Grasmeijer of Holland set her first world record (WR) in the freediving discipline of Free Immersion (FIM) and in doing so she has become the youngest female to ever set a world record (pending doping tests). The 20 year-old Dutch freediver, Grasmeijer, successfully descended down a line 90 meters and returned to the surface exactly four minutes and :19 seconds later to be greeted by a white card from the judges. “Grasmeijer came up clean,” said AIDA judge Grant Graves. “During the first two seconds of her surface protocol there was the slightest bit of shakiness, but then it was clear Jeanine was fine. She did not celebrate much either — Jeanine was just very calm.” Staying calm and cool under-pressure is a very desirable trait for a competitive freediver, and one that will serve Jeanine well. 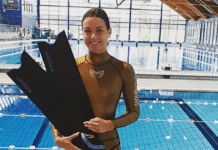 With the double record-setting dive of 90m FIM under her belt it will be interesting to see what other performances the young freediver posts as a relative newcomer to the competitive sport. Jeanine’s new World Record surpasses the previous record held by Natalia Molchanova also set in Greece, back in 2011. 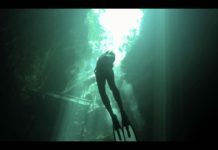 DeeperBlue.com heartily congratulates Jeanine Grasmeijer on this tremendous achievement. As far as I know Natalia did 91m in 2013? Correct – after this record by Jeanine (11 Sept 2013), Natalia reclaimed the World Record with a 91m dive.